This image was disqualified from the Off With Their Head! challenge. You may not use ANY editing tool to move, remove or duplicate any element of your photograph that would change a typical viewer's description of the photograph (aside from color), even if the tool is otherwise legal, and regardless of whether you intended the change when the photograph was taken. 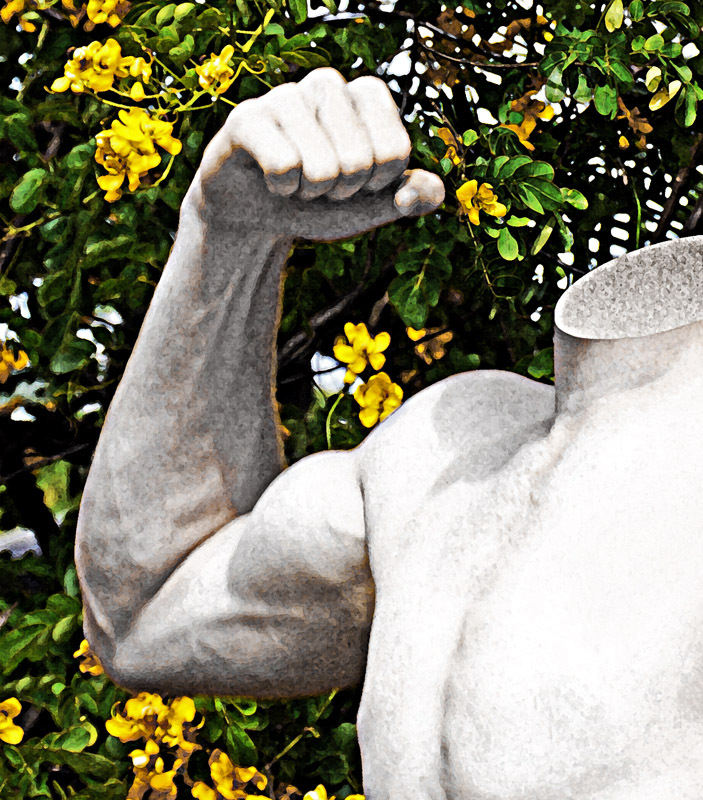 Sorry, gotta call this as either DNMC as a statue with no head that you took a picture of, or breaking the rules for using a picture of a muscled guy, cropping his head, and using expert-level challenge editing tools to make him look like a statue and then putting him into another picture. i'm giving this a 1/10 based on the image and i have to flag this as suspect of rules violation even though i don't see this as a contender for a ribbon. rules are rules and apply to all entries. Had this been a statue, it would not be grounds for a DQ. If you removed your son's head in Post processing, then that would be a reason for a DQ as that's not allowed in Advanced Editing. Regardless, since it looks like a statue, you're going to get people who, like me, think it DNMC because it appears to not be a real person. But even it it looked like a person, cropping the head should be cropped by the frame, not edited out or hidden. Yes, nice bicep. Liking this for its' form. Wish it were in BW... so the color didn't detract from your smart idea. Proudly hosted by Sargasso Networks. Current Server Time: 04/18/2019 08:51:18 PM EDT.